born March 26 1959 in Sokilnyky. 1982-1987 studied at Lviv Academy of Art. 1995 - "Religion - the past and the present" (Lviv). 1995 - International Planer near Gloczow "Chojemysl-95" (Poland). Stained Glass works in private collections in Germany, Israel, Canada, USA, Poland. 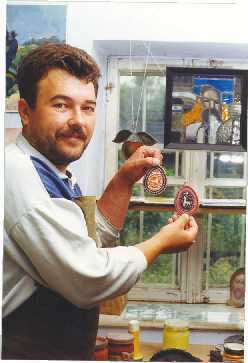 All of Anatoli's stained glass art is done by methods that have been taught for 100's of years in Europe. Each work of stained glass contains not only cut pieces of glass but artfully painted panels as well. Then, the each piece ofglass is kiln fired for several hours to permanently set the paint into the glass. The same technique used by craftsman for churches throughout Ukraine. Each stained glass is an individual work of art and no 2 are exactly the same. We will also do custom stained glass designs, liturgical or modern.